Doing this post reminds me I still have a couple of questions left to answer in that old post where I asked you for those questions. Okay, going back to that post about Boris the Bear and variants an’ stuff…. As best as I can recall, these were just sent out to newsstands in scattered areas around the country. Our local area seemed to me hit with a lot of copies of Justice League , but I personally bought a copy of the Firestorm variant from a newsstand in Oxnard, so some did make it out here. But I recall having at the previous place of employment a sizable stack of the JL book that, frankly, didn’t show much sales movement…I suspect the higher prices in the price guide reflected the secondary market in areas where said variants didn’t get sent, while out in sunny Califor-nee nobody much cared. 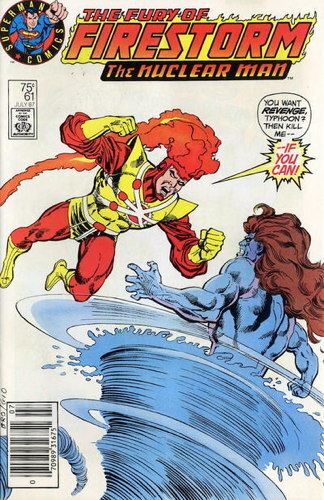 The Firestorm cover, however, I almost never saw come through the shop, so I assume 1) it wasn’t as widely distributed around here and 2) well, duh, just realized Justice League sold quite a bit better than Firestorm so of course there’d be more of the former. Yeah, that sounds right. I think it’s fair to say that perhaps Dark Horse was being a little…politic in not directly saying naming DC Comics and saying it was all their fault. There was also a parody of Man of Steel called Man of Rust that also had two variants, but that was out around the same time as that issue of Boris the Bear . I wonder how many of the early “variant covers” wave were just variations on Man of Steel ? That’s fair, but there were probably enough people going to comic shops who knew their comics would be out now and didn’t want to wait two weeks for the other edition to hit newsstands, assuming local newsstands would even get the book in question (and sometimes not all of them did). It just became easier to have one place to go to get all their comics, instead of touring the neighborhood hitting all the convenience stores to get the issues they needed. …Though between you and me, sometimes I have that nostalgic feeling about riding my bike from 7-Eleven to 7-Eleven, hunting and gathering the latest releases every Tuesday and Thursday. I don’t think the flyer’s referring specifically to that, given that they’re addressing the multiple cover images on Boris . However, though I haven’t had many inquiries about this in a long time (since it’s mostly not an issue anymore), I did used to get people asking me if it made any difference if there was a UPC code on the cover, or if there was a little picture of Spider-Man where the UPC code should be? Actually, I just remembered I talked about this very topic at length a year or so ago right here. Yes, actually, it took off right away and the first issue did acquire some premium pricing in short order. Weird for a non-superhero comic from the Big Two at the time…I remember rarely if ever having copies of that particular issue in stock at any given time. In later years, that issue and the ones with, um, the Punisher (sigh….) still retained some demand. Not really anything too juicy, alas. They replaced long-running series that were probably experiencing dips in circulation with proposed ongoing series of mini-series, which I’m guessing they were counting on sales bumps from new #1s every few months. I don’t know how successful those minis were, but it was probably still a comedown from having several ongoing regular monthlies on the stands at the same time. I also think First was looking into, or just beginning to start, a chain of retail comic shops, and if I’m recalling that correctly, that may have eaten up some resources too. And I there was other stuff, I’m sure…I’ll have to go back through my Comics Journal s from the period and see if there are any write-ups about what was goin’ on. as I recall from the trade press at the time, First was an early victim (see also Crossgen and others) of not preparing for returns from bookstores. They pushed Classics Illustrated HARD into bookstores, and they were ordered strongly. But then, after some shelf time, copies started being returned, as bookstores do with their stock. First, being a direct market company, thought of those initial orders as sales, and was not prepared for the returns (and thus credits) that happened. There were other issues as well – most of the original “indie” publishers were either gone or collapsing by then, and First never really got a strong media tie-in to tide them over, like Dark Horse did. They also never sold any of their properties for adaptation like Dark Horse did. I’m surprised that the DC legal department allowed the Justice League cover to go out with the Captain Marvel name printed on it. My layperson’s understanding of trademark law is that DC was prohibited from referring to the character as “Captain Marvel” in any marketing material (so the character couldn’t be referred to by that name on book covers, toy packaging, TV ads (for the old TV series), etc. In the context of the story they were free to refer to him as whatever they wanted, but on the over was a big no-no. 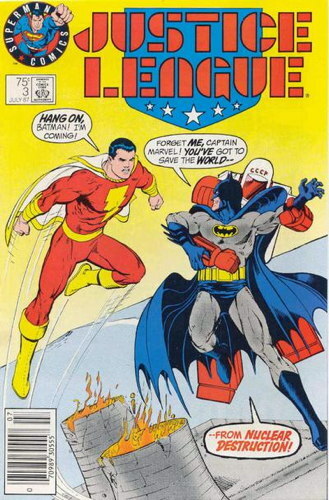 I think that’s why the 1970s comics series stopped using the tagline “The Original Captain Marvel” underneath the “Shazam!” title after about three or four issues and changed the tagline to “The World’s Mightiest Mortal” (likely after receiving a cease-and-desist order from Marvel). Also concerning First: their plan was to relaunch all their books as prestige format minis, but none of them actually saw the light of day. First declared bankruptcy in 1992, I believe, and the rights to their titles had various degrees of difficulty to untangle. I recall a Dreadstar series coming out in 1993, but it was pretty damn awful, and I seem to recall Nexus and the Badger returning in the 90s. Grimjack, however, had a particularly long battle to get the rights back, and it came back around 2006 or so. Sometimes I wonder what 1993 with First Comics around would have looked like. Even their superhero titles were pretty atypical. Probably a lot like what Dark Horse was doing, I imagine. There really was a unique feleong of hunting down titles when all you had was newstands. I would mow lawns for cash and then head out on my bike to hit two 7-11’s, a Stop-N-Go and a Safeway trying to find books. I can’t find the actual release date, but another variant from 87 was Amazing Spider-Man Annual #21. Seems more likely to be a subject of complaint than Boris, I think.